We hope you will join us in Toronto for our concert with the Toronto Children’s Chorus at St Anne’s Church, 270 Gladstone. It is an afternoon concert, beginning at 3 pm. We are really looking forward to working once again with this exceptional group. The TCC has been around for almost as long as NEXUS (37 years!) and has a reputation as one of the finest treble choirs in the world. They tour often both within Canada and abroad and they are, quite simply, excellent! 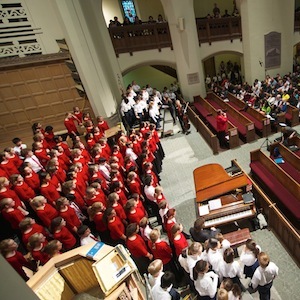 The Toronto Children’s Chorus Training Choirs and Choral Scholars will perform some wonderfully stirring music with NEXUS, created by Russell Hartenberger and Rick Kvistad. As well, the Choral Scholars will perform Steppin’ Out, choreographed by the incredible Jennifer Swan, founder of the Swan Studio Dance and previous choreographer to Olympic gold medalists Tessa Virtue and Scott Moir (Ice Dancing). In a few months the TCC is heading to Carnegie Hall and to Boston, so please do take this opportunity to hear them here at home in a unique and colourful program! Tickets are available by clicking here. See you at the concert!